Well, just the thing to brighten up a Friday morning… Have you ever been stuck, away from home with no clean underwear? Extended delay in an airport, perhaps? Or, dare I say it, a one night stand! Well fear no more, an ingenious new machine has been launched selling just pants, socks and the occasional tee-shirt – never again will you be stranded with dirty knickers. 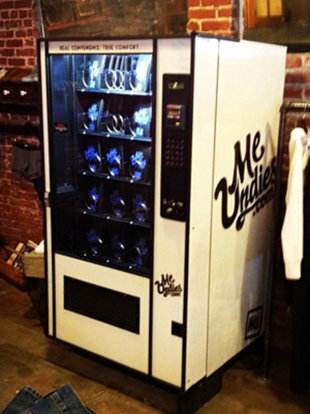 The “Me Undies” machine has recently been installed in a Hollywood boutique with expansion planned in the USA. The company behind the machine plan to place these in gyms, hotels, airports and in retail stores, bringing total convenience to the user. This is just another example of traditional retail diversifying into the vending sphere, which is beginning to make waves… if these machines make it over the pond, would you rather queue for hours in a certain budget clothing store for your socks (don’t pretend that you don’t buy them there) or would you rather bounce up to the machine and make your selection without having to deal with people, or let them judge you on your underwear preferences?! How do you feel about bricks and mortar retail moving towards innovative vending? Do you enjoy the face to face aspect of shopping or do you prefer self service checkouts, vending machines and not having to deal with other peoples bad days!? We love to hear your comments so please let us know what you think, or over on twitter or at our facebook page!